Moving from 28nm to finFETs provides a 1.2X improvement in power and performance. Here’s how to get better results. Recently Qualcomm announced their new SnapDragon processor 820, which was designed using finFET technology. They showed some amazing results, such as 2X improvement in performance and 2X improvement in power compared to 28nm designs. Previously, when ARM announced their A72 processors in finFET, they too had claimed 3.5X improvement in power compared to 28nm designs. But can designers expect such dramatic improvement just by moving to finFET? Do they need to do anything more? If so, what extra steps do they need to do? We will be exploring these questions in this blog. Let us look at the benefits of the finFET technology. FinFETs offer either a 1.38X improvement in performance using the same power or a 1.5X reduction in power at the same speed, when compared to 28nm process. If we were to draw a curve between these two points, it will appear something like what is shown in figure 1. From the above figure, we can find a point that gives the same scaling on both power and performance. This point denotes the benefits in power and performance just by migrating to finFET. 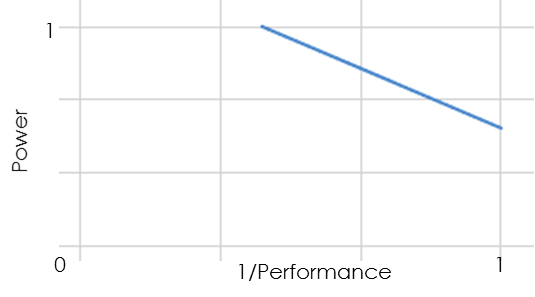 Using this curve, we can find that it corresponds to 1.2X. This means, if we just migrate a design from 28nm to a finFET process, we should see an improvement of 1.2X on both power and performance. How can we get even better performance and power improvement? Let’s discuss strategies to achieve power improvement for finFET designs. Focus on dynamic power reduction. Better control of dynamic power is possible only at the early abstraction levels of design. If we wait for the gate-level implementation, several opportunities to save dynamic power are lost. Circuit choices that reduce switching activity must be preferred over other metrics. Clock gating is one of the popular techniques used at higher abstraction levels and is also useful at the gate level. Sequential clock gating can deliver higher dynamic power savings than combinational clock gating. Other techniques such as data gating and memory gating can reduce dynamic power considerably. Make correct microarchitecture decisions for low power. Selecting the correct microarchitecture can save a lot of power. For example, in an application where a small set of data gets used over and over again, using a small register file can save a lot of power vs. using a large memory. Another example is inserting block-level clock gates at the appropriate level of hierarchy using specific gating conditions; this can save a lot more power compared to letting the backend tools do automatic clock gating. Using these strategies, both ARM and Qualcomm were able to improve upon power efficiency beyond what is offered “for free” by the finFET process. ARM used register file reorganization, power efficient tuning of execution units, and dynamic power reduction of every block to achieve greater power efficiency. Qualcomm used microarchitecture improvements like cluster multipliers and a number of dynamic power reduction techniques to achieve their numbers. What are your strategies for designing for power with finFETs? I would like to hear from you.